Play thru 50 levels and learn to Create your own content, then go online and Share your levels with the world! Play 18 new levels designed by members of the LittleBigPlanet Community plus 1 Million user generated levels online to discover! Over a dozen bonus costumes & new level packs with game upgrades like the Paintinator! 11-08-2017 silverbow Box Text GAME OF THE YEAR Winner of over 80 awards including 15 Game of Year Awards Play Create & Share! Play thru 50 levels and learn to Create your own content, then go online and Share your levels with the world! Bonus Levels! Play 18 new levels designed by members of the LittleBigPlanet Community plus 1 Million user generated levels online to discover! FREE Add-On Content! Over a dozen bonus costumes & new level packs with game upgrades like the Paintinator! 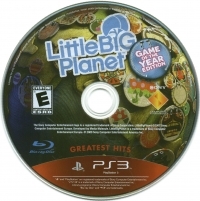 This is a list of VGCollect users who have LittleBIGPlanet - Game of the Year Edition - Greatest Hits in their Collection. 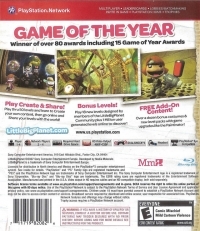 This is a list of VGCollect users who have LittleBIGPlanet - Game of the Year Edition - Greatest Hits in their Sell List. 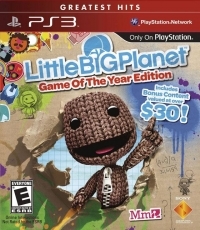 This is a list of VGCollect users who have LittleBIGPlanet - Game of the Year Edition - Greatest Hits in their Wish List.